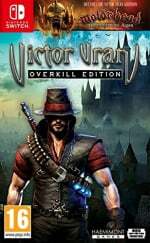 "You win some, lose some, all the same to me"
Wired Productions has announced that Victor Vran: Overkill Edition will be getting its teeth stuck into the Nintendo Switch on 28th August. Featuring local two-player co-op, with up to four-player co-op online, Victor Vran: Overkill Edition has players teaming up for some good old demon-slaying action. As previously revealed, The Switch release will feature two expansions: Motörhead: Through the Ages, a wild tour through the mythos, music, and attitude of the legendary rock band; and Fractured Worlds, a "challenging and empowering" new chapter in the game's story. Players can forge their own personal version of Victor by utilising a vast array of powerful weapons, game-changing outfits, and wicked, spell-like demon powers, all while taking on waves of demons and clever boss monsters. This definitive edition will be available in both physical and digital formats, with a recommended retail price of £34.99 / €39.99 / $39.99. Are you excited for this one? Let us know if you'll be going demon hunting this August with a comment below. It was marked to June I'm really waiting for double dipping this game. looks interesting. never heard of this. Day 1 - alone because of ingame Motörhead music. This + Titan Quest will give something if Diablo 3 is not coming to the Switch. Ive seen this as low as $16 on PS4 (at 19.99 mostly)... No point paying 39.99 now. It will join the bargain bin also. I was stood right next to Lemmy at passport control at Schipol Airport a year or so before he died! Looking exactly like you'd expect Lemmy too look like. Can't say I'm a fan of their music, I like a couple of their songs but this game does look pretty good. It’s all about the game, and how you play it. It’s all about control, and how you can take it. I'm interested, not really at that price though. I passed this up on PC multiple times at a much cheaper price, mainly because there was no shortage of good aRPG's at the time. I have been looking for a new aRPG to play through local co-op with the wife. Sounds like this might fit the bill. Does anyone know if this features cross play to other platforms? Yes yes and yes I've been waiting for a release date for Switch this looks like it's fantastical. I have this on PC and I love it!